The Rev Nick Lawrence is the newly appointed 28-year-old vicar in the "quaint and historic" village of Lakehurst in Sussex. He had previously been curate in a run-down working class parish in Manchester. Before he was ordained, he had lived with a cellist from the Manchester Philharmonic “but she had left him after four years and gone off with a trumpeter.“ He is single and a good cook. Several women of the parish have their eyes on him. 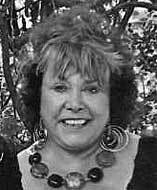 Deryn Lake is the psedonym of Dinah Lampitt, author of numerous historical novels including the apothecary John Rawlings series. She was born in Ilford in Essex. She attended Putney High School but says that she didn't really like formal education very much and, as a teenager, used to write "rather bad historical novels". She went on a journalist's course at the Regent Street Polytechnic and ended up working for The Evening News where she married the Assistant Editor, L.F. (Bill) Lampitt. They had two children. By the time he died in 1982, she had returned to writing and her first novel, Sutton Place, was published in 1983. She now lives near Hastings in East Sussex. 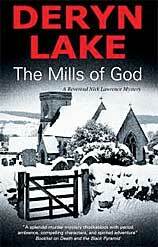 The Mills of God is set in 2009 in the sleepy Sussex village of Lakehurst (where "everybody knows everything that is going on") but which has suddenly become the scene of a series of violent murders, each accompanied by a note signed “The Acting Light of the World". Detective Inspector Tennant of the Sussex police (who has “unusually bright green eyes which radiated intelligence") turns to trendy young vicar Nick Lawrence for help in untangling the apparently religious connections, and it is Nick who is able to point out a link to the Ten Commandments. By the end, Tennant improbably seems to spend much more time with him than with his own police colleagues, and the situation grows increasingly unlikely when he even gives Nick one of the murderer's notes: "You keep it, Vicar. We've got plenty of these. If you get any bright ideas don't hesitate to ring me." The plot creaks, and the author does not seem to show too much real understanding of the workings of the Church of England. So, for example, there's a welcoming service for the new vicar laid on by the local congregation, but no mention of the licensing/induction service which would have preceded it. Many of the village characters are little more than stereotypes. These include actor Richard Culpepper (described as “a vision of yesteryear. A matinee idol, circa 1950, stood there. Dark hair swept back immaculately, very bright and twinkling blue eyes, a thin and small moustache, a dazzling smile, all combined to leave a lasting impression on whoever he was meeting"). And there's Ceinwen Carruthers, one of the PIxie Poets who believed in "the wee folk" and "could have stepped straight out of the fifties" with her "dirdnl skirt and sandals .... strange white blouse covered with a hand-crocheted shawl" and a house that was "an altar to tweeness" with her own "little framed poems hung on the walls, together with pressed flowers and cut-outs of rather malicious-looking children in jolly seaside romping gear". And there's even Old William, the conventional vicarage ghost, who goes round banging doors, but Nick soon gets used to him. Then there's expert violinist Olivia who “was absolutely stunning, Nick thought, with her great tumbling mass of curling black hair, light green eyes and smiling mouth. In fact he was so knocked out by her presence that it took a great deal of self control to maintain his dignity and carry the glasses over to the table." But, of course, as in all the best romantic mysteries, he is not the only one who is keen on her. There is also the handsome Dr Rudniski ("definitely European, Nick decided, his manners were far too good for him to be anything else") and even Inspector Tennant who “had had a slight crush on her for years in a manner quite unsuitable to a man of his age." So, right in the middle of his desperate murder investigations, Tennant can still spare 15 minutes to stand outside her front door listening to her playing before he interrupts her! Despite all the murders, and the melodramatic denoument, it is gently amusing in places, but Nick does not make a very convincing clergyman.The author says she hopes to be using a religious adviser in future, but it is more than just outward trappings that need to be put right as Nick also seems to lack any sort of spiritual insight. And as he himself says, Lakehurst is indeed "a truly strange place." The author has her own informative website. The cover is quite attractive if misleading, as there is no mention of snow in the story! Another example of a designer who had never looked at the text?